A recovering anorexic whose weight plummeted to just 5st told how becoming a personal trainer is helping her overcome the illness. 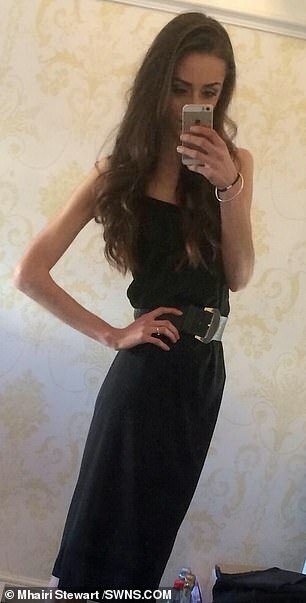 Mhairi Stewart, 22, of Glasgow, began rapidly losing weight after she left school, where she had been bullied over her sporty nature and naturally slender frame. In the throes of the illness, Mhairi found herself exercising for up to eight hours a day and was eating as little as 300 calories – roughly a sixth of the recommended daily intake for a woman. She was admitted to hospital as a result of her condition in 2015, weighing just 5st 5lbs, and realised it was time to make a change. Determined to tackle the illness, and with the help of a coach, Mhairi qualified as a personal trainer and now helps others on their fitness journeys. She said: ‘It started when I was leaving school. I had always been bullied because I was sporty and skinny. I was the odd one out and I got picked on a lot which meant my self-esteem was really low. ‘I didn’t know what I wanted to do with my life and my grandad, who I was really close to, had died. Mhairi left school and became a make-up artist. She felt she was ‘surrounded’ by girls who ‘all looked amazing’ and said she ‘just wanted to be as thin as she could’. ‘I never saw it happening to me,’ she continued. ‘I was so enthralled in the gym. I loved it and I just got worse and worse. ‘I was in the gym seven days a week for six to eight hours and getting up at 5am so I could make sure I go. ‘And I was walking 10km a day and lifting weights for four hours a day. It was so controlling, it was like I didn’t have a choice, I had to do it. Mhairi would eat 20g of porridge in the morning, a protein shake, an apple, and egg whites and a salad for dinner. She wore a heart monitor every day and began wearing baggy clothes to hide how thin she was when other people began commenting on her weight. Mhairi said: ‘My family tried to help me, to help me see what I was doing to myself. ‘But it didn’t matter what anyone said to me, I had made my choice and that was what I was going to do. The breaking point came in 2015 when 5ft 9in Mhairi was referred to an adult eating disorder clinic. Her BMI had dropped to 12 when it should have been above 15, and she was admitted to Gartnavel Hospital, Glasgow, where she spent four weeks. Mhairi knew she had to try and get better and by 2016, after completing an HND in health and fitness, she got a job as a personal trainer. She said: ‘I decided I wanted to get better and that I never wanted to go back to the hospital or be in that situation again. ‘I hired a coach who helped me with my food management who got me to 55kg, which at the time I found really hard because I didn’t like seeing my body that way. Mhairi, who owns her own business called Mrs PT, is now a healthy 10st 2lbs. 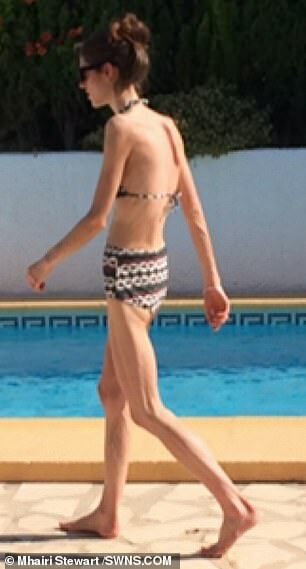 And with the help of her weightlifting boyfriend Adam, 26, Mhairi’s strength has improved so much that she’s heading to Physical Culture Association competitions. The personal trainer now eats roughly 1,700 calories a day in the form of balanced, high protein meals. In May 2016, Mhairi posted her first shocking before-and-after pictures showing her body’s transformation over the past couple of years. The pictures have inspired lots of her followers on social media but Mhairi says seeing the ‘before’ pictures don’t shock her the way they do others.